It has become a necessity for a business – whether small or large – to have a website. Some have reached out to professionals to design their sites, while other establishments have chosen to develop one themselves. 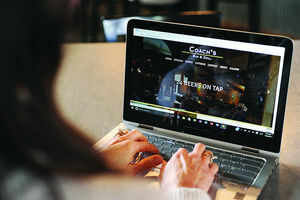 The website for Coach’s Bar and Grill was made by an outside company. As co-owner of the Stevensville restaurant, Jeannine Van Liere said they first launched their site three years ago. However, they did a complete makeover three months ago. Van Liere said it was a long process updating Coach’s site. She spoke to the Jackson company extensively over the phone on what she wanted the site to look like. The end result was a more user-friendly site that had photos of food, connectability through the business’s social media accounts and a list of ever-changing quotes from legendary coaches. At Forever Books in downtown St. Joseph, owner Robin Allen said their website is based on what is provided by the American Booksellers Association. She says by using the national search engine as a website, it expands her store’s inventory to more than what her bookstore has to offer. With an added cost every month for Allen, her customers can shop 24/7. The site also allows her to make announcements about events or sales they’re holding. Van Liere said a business owner should take time to consider what goes on their website because that can be the first impression for a prospective customer. Kathleen Wolf, senior manager of Corporate Reputation and Interactive Media for Whirlpool Corp., knows what makes a website successful. The website was created internally on a WordPress platform that uses flexible templates for page layouts. Its traffic ranges anywhere from 60,000 to 90,000 site visits per month. Visitors are primarily in the U.S., but also come from Canada, India and Brazil, among other areas. Wolf said she learned sites succeed when they meet a user’s goals. Wolf said many businesses get excited about creating the initial website but fail to plan for updates. In other words, if a business wants consumers to return to its website, the content has to change regularly.